I can’t believe it’s been over a month since I last posted! See? I knew my laziness would get in the way of my New Year’s resolutions. I could pretend that I disappeared due to being busy and blah blah blah, but let’s be real. I’ve been a total sloth since January. Anyway! I’m finally back to talk about something (or rather…someONE) that has thrown the entire world into a frightening state of chaos. As I’ve mentioned many times before, I teach at an international preschool here in Denmark. My students represent 13 countries around the world, and several could be negatively affected by President Trump’s travel ban and other policies. I don’t have to go into detail about how I feel about Trump because it’s obvious that I’m angry. My parents are latino immigrants (now citizens) who still live in the States, and they are among millions of people who feel uncertain, undervalued, unheard, and unrepresented. My anger grew steadily after Election Day and hit its peak on the day Trump took office. I couldn’t believe that someone who spread such hatred and close-mindedness made it to the White House. I was furious. I was enraged. I began to hate. And then it hit me: We cannot defeat hatred by spreading more hate. As the reality of the inauguration set in, I thought about my students and how their lives could be effected by the next 4 years. Even though I just want to shield them from all negativity and protect them from reality, I know that it would do way more harm than good. Instead, I decided to turn this into a positive learning experience for my preschoolers (without getting too political, of course). Student 1: Are some people sad that Mr. Donald won? Me: Yes. There are a lot of people who are very sad and mad. Me: Because Mr. Donald is only a nice friend to some people and not everyone. That’s not very fair. Student 3: Is he being a rude friend? Me: A lot of people think so, but everyone makes rude decisions sometimes. Do we sometimes make rude or thoughtless choices here at school? Me: But does that mean that we can only be rude or thoughtless? Me: So what can you do to help a friend who is making a rude choice or using hurtful words? 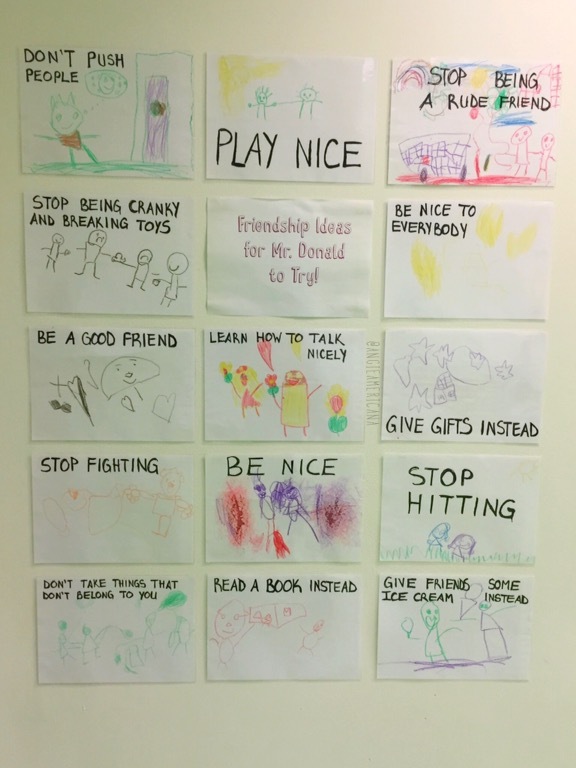 Student 4: Help them be a nice friend! Me: So if Mr. Donald is being not being a nice friend now, does that mean he can never ever be a nice friend? Student 5: We can help him be nicer to all friends! 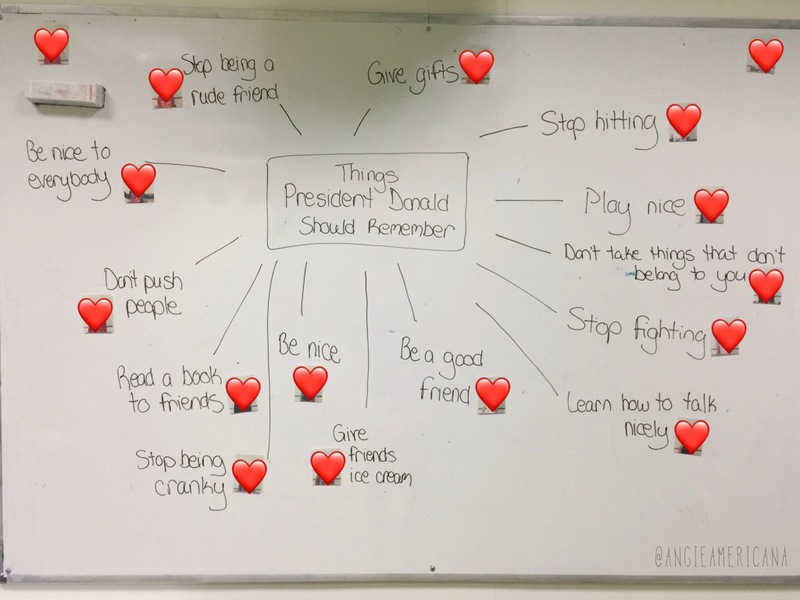 This conversation lead to a brainstorming session where we came up with ‘Friendship Ideas’ for Mr. Donald to try, so he can learn to be nicer to everyone. I’ve included a picture of our mind map below. Keep in mind that the ideas that they came up with are completely their own. Since they are only 4 and 5, it’s inappropriate to get into the politics regarding religion or race. We merely looked at it from a friendship standpoint, because that’s the most relevant connection to their own lives. I covered up all the pictures of my students because…ya know…privacy. After we created the mind map, I decided to take it a step further. I showed them pictures of children and their families who participated in the numerous Women’s Marches around the world (which I referred to as ‘Friendship Marches’). We talked about how marches like this are a good way to express our feelings when we are unhappy or angry about a vote or decision. The most important thing I conveyed to my students is that we cannot solve problems if we are mean or negative. Positive changes only come from positivity. At this point, my students became interested in the protest signs in the pictures we were looking at. I read some age-appropriate ones for them, and they began asking if they could make their own. Of course I said yes and set up the art table with paper and crayons. Using their mind map as a reference, they drew pictures of the advice they wanted to share with Mr. Donald. I then wrote the message on their sign and laminated them. Later in the day, we took them out to the school playground for our own Friendship March. I know this post is a little bit on the emotional side, but I cannot express how vital it was for me share this lesson with my class. No matter what, they will learn their ABCs in my room, but there are other necessary skills I want them to practice, such as compassion, fairness, and openmindness. But above everything else, I want to help my students develop the confidence to use their voices to speak up against unfairness. Because if they learn to do so now, they will be less likely to stay silent when they see discrimination and injustice in the world around them as they grow up. The passion my class had while making their signs and marching around the school gives me hope that hatred will not win, and that we will not only survive the next 4 years. We will overcome, and we will thrive.